Lord Trivikrama Perumal graces the devotees from the sanctum under the Sri Chakra Vimana. Lord Venugopala plays the Kshetra Palaka role. 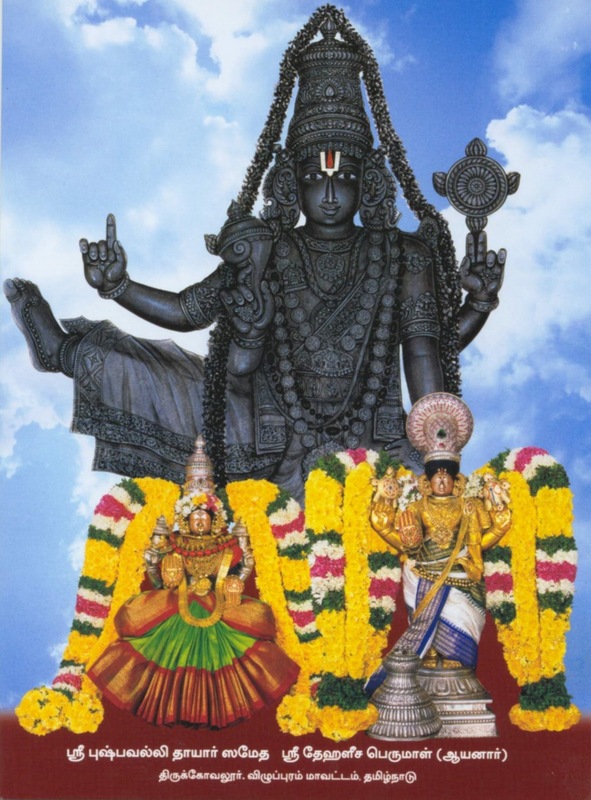 There are shrines in the prakara for Lords Venugopala, Lakshmi Narayana, Lakshmi Raghava, Lakshmi Narasimha, Sri Rama and Sri Veera Anjaneya, Mother Sri Andal and Shukracharya, the Guru of Asuras. 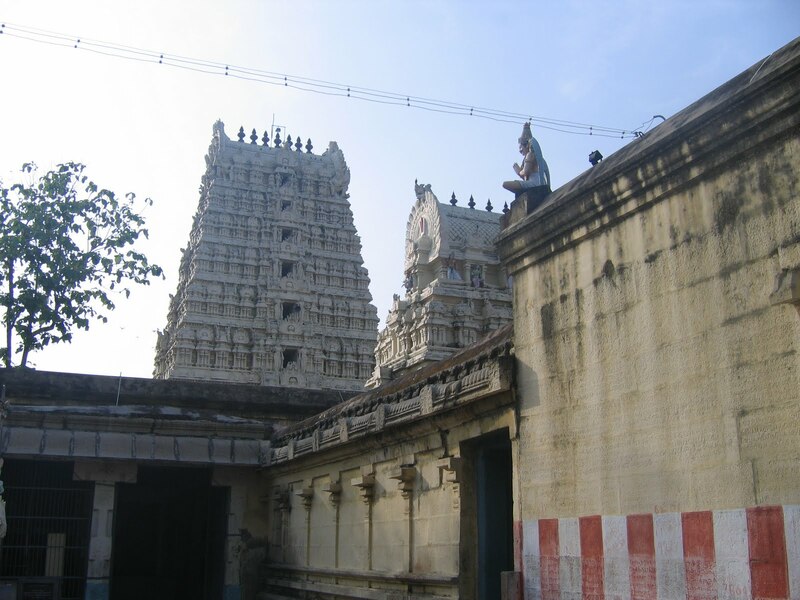 The tower of the temple is the third tallest in the state, the first at Sri Rangam, the second at Srivilliputhur. This is a 11 tier 192 feet tall tower. The temple area covers 5 acres. Even after crossing the main tower, there are residential parts. The place is praised as Nadu Nadu Tirupathi. There is a temple for Lord Vamana Murthy in Tirukakarai in Kerala. Vamanamurthi graces here from behind the presiding deity. Emperor Mahabali, though good natured, ever helpful to those in need, had a desire that none should exceed him in status and fame. To realize this aim, he conducted a great yajna headed by his Guru Shukracharya. Lord thought to bring down his pride. He took the form of dwarf, came to the Yajna field and sought three foot steps of land (three steps by His foot) as dhan (charity). Guru Shukracharge sensed some mischief in the dwarf and understood that the visitor was none other than Lord Vishnu. He vehemently warned Mahabali and did his best to prevent his promise. Mahabali did not relent. He was only keen to keep up his word to dwarf and offered His wish. Lord took His Vishwarupa, measured the earth by one foot step and the Akasha by the second step and there was no place for the third step and asked Mahabali for the third. Mahabali gracefully accepted his inability and offered his head for the third. Lord placed his head on Mahabali and demanded that he solemnize the dhan with water from his right hand. Mahabali took the water bowl to confirm his promise but Shuracharya took the form of a bee and blocked the hole of the bowl from releasing the water. Lord Vishnu took a grass piece, put it on the bowl hole that blinded the Guru. Mahabali was pressed by the Lord to the Padala Loka and taken later with Him, goes the story. Any devotee who would indeed like to read and enjoy this Vamanavathara-Trivikrama story of Lord, should read Sriman Narayaneeyam by Narayana Pattadri and Srimad Bhagavatha by Sage Veda Vyasa. They will have to close the book only unwillingly. The object of Lord in His Vamanavatara-Trivikrama Avatara was to teach that wealth of even great kings should not land them pride and arrogance. He took the Vishwarupa, measured the space with His right Leg and the Earth with the right. He stood too tall touching both earth and sky. In His extreme delight to bless Emperor Mahabali, the illustrious grandson of Prahladha who was instrumental for His Narasimha Avtar, Lord appears here with the conch in the right hand and the discus in the left-vice-versa. This is described as His teaching wisdom to devotees. His posture-left leg on the earth and the right in the sky-appears as if He is asking where to place His foot for the third foot of land due from Mahabali as promised to Him. Lord Brahmma is worshipping the foot in the sky. This is a very popular story of Lord Vishnu as a Vamana seeking three foot step land from Mahabali, which he could not afford as Lord had covered both earth and sky with two feet itself leaving no space for the third. Sage Mrigandu wanted to have this Vishwarupa Darshan of Lord and approached Lord Brahmma for His advice. Brahmma suggested that the sage go to Krishna Kshetra (now Tirukovilur) on the banks of Krishnabadra River to realize his wish. The sage along with his wife Mitravathi came to this place and performed severe penance for the darshan of Lord. Lord came to their abode in the guise of an old Brahmin and begged for food. They didn’t have even a single grain of rice to offer. The sage turned to his wife. Mitravathi went in, took a bowl in hand and prayed to Lord Narayana to fill the bowl with food if she was the chaste wife of the sage. The bowl was full of delicious food. Pleased with their penance, Perumal granted His Vishwarupa darshan to the sage couple. This is the holy place where the first three Azhwars-Poigai Azhwar, Boodhathazhwar and Peyazhwar- met together incidentally by the grace of Lord. It was night raining heavily. Poigai Azhwar sought a place in the Ashram of Sage Mrigandu. He was shown a place to rest down. After a little while, Boodhathazwar came to the same place for a space. The first Ahwar shared the space just sufficient for two to sit. The third Azhwar-Peyahwar too came there. The two shared the space with him sufficient only for standing. Suddenly, they were pressed due to the presence of a fourth comer who was but Perumal Himself granting His darshan. The songs sung by the three Azhwars how they were blessed with darshan of Lord as lighting a lamp to dispense the rainy darkness, is chanted even now by the devotees while lighting lamps in their houses in mornings and evenings. The Three Azhwars attained salvation in this holy land. Lord Perumal is praised as Ulagu Alanda Perumal-Ulagalanda Perumal as He sought a small piece of land measuring just three feet. The idol is made of wood in a standing posture, the tallest in the country. Against the tradition, Perumal is holding the conch in the right hand and the discus in the left. Of the 108 Divya Desas of Perumal, this is the only temple with Swayambu Vishnu Durga. This is an important kshetra for the Vishnavas and Hindus in general in the Nadu Nadu region. The tower of the temple is third tallest in the state scaling 192 feet. Shukracharya, (Venus in the zodiac sign) Guru of the Asuras, has a place in the temple. It is noteworthy that the holy scriptures Nalayira Divya Prabandam containing 4000 verses in praise of Lord Vishnu sung by 12 Alzhwars from time to time at various places, began from Tirukovilur. It is mostly in Shiva temples, we see Mother Vishnu Durga in the prakaras. In Tirukovilur temple, Lord and His beloved Sister Durga (Maya the feminine form of Lord Vishnu) are in shrines nearby to each other. Tirumangai Azhwar who generally praises Lord alone in his hymns had made a devotional line to Mother Durga in one of his verses. People pray to Mother Vishnu Durga during Rahu Kalams on Tuesdays and Fridays for relief from the adverse aspects of planets. 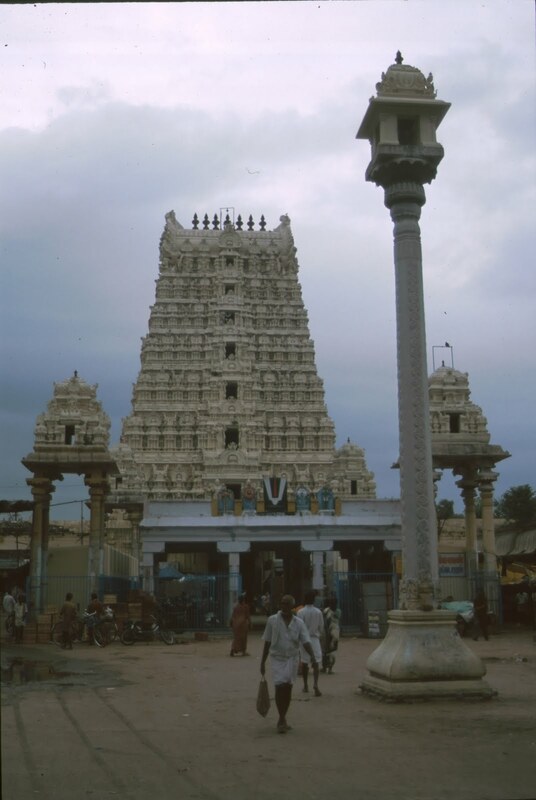 There is a 40 feet tall Garuda Pillar with a small temple built on it opposite Perumal shrine. It is believed that Garuda Bhagwan is worshipping Lord from this temple. 5) Kabisthalam, Tirukovilur is the first. Lord Krishhna in this temple, made of Salagrama stone, graces the devotees from a shrine on the right side of the Gopuram entrance. The devotees must begin the worship from this shrine and pass to the presiding Perumal only then. Great Vaishnava Acharya Manavala Mamunigal also had rendered many hymns in praise of Lord Perumal. According to scriptures and Tamil literatures. Sage Parasurama and Sage Agasthya had performed penance at Tirukovilur. The puranic age Krishnabadra River is flowing now in the name of Thenpennai. Before butter (Vennai in Tamil) melts, Pennai (the name of the river) melts, is an old saying. Devotees strongly believe that Lord Trivikrama would respond their prayers seeking high positions, promotions and regaining the positions they have lost. Devotees are blessed with happy wedding, children and freedom from enemies. Lord Chakarathzhwar frees the devotees from the evil effects of spells and witchcrafts. Festival: 15 day Panguni Brahmmotsavam in March-April with Sri Pushpavalli Thayar Oonjal on Friday drawing huge crowd and Masi Magam in February-March, Lord visiting Cuddalore carried on the shoulders of devotees are the main festivals of the temple. Other festivals are Purattasi Pavithra Utsav and Navarathri in September-October; Chithirai Sri Rama Navami, Sri Ramanuja Jayanthi and Vasanth Utsav in April-May; Vaikasi Visaka Garuda Seva, Nammazhwar Sattrumurai in May-June; Aani Periazhwar Sattrumurai in June-July; Aadi Thiruvadipooram, Andal Utsav in July-August; Avani Sri Jayanthi, Uriyadi utsav in August-September; Aipasi Mudalazwar Sattrumurai, 10 day Sri Manavala Mamunigal utsav in October-November; Karthikai Kaisika Ekadasi; Tirukarthikai in November-December; Margazhi Rapathu, Pagal Pathu, Vaikunda Ekadasi in December-January. Besides the above, important days as Pongal-Makar Snkranti, Deepavali, Tamil and English New Year days are also observed with special pujas to Lord Trivikrama. The temple is open from 6:30 a.m. to 12:00 noon and from 04:00 p.m. to 08:30 p.m.
Tirukovilur is on the Panruti-Vellore route. Bus facility is available from Villupurm. The place is 75 km from Cuddalore, 36 km Villupuram, 36 km from Tiruvannamalai and 40 km from Kallakurichi. Tel : 04153 252552 or 90032 97798 or 94862 79990.